I have some idiosyncrasies. Actually, most of them are pleasant but kind of strange things that I do. When traveling aboard, I love picking out souvenirs, which will provide vivid memories of being in some foreign land. When I went to Greece, I got a double axe for my necklace. 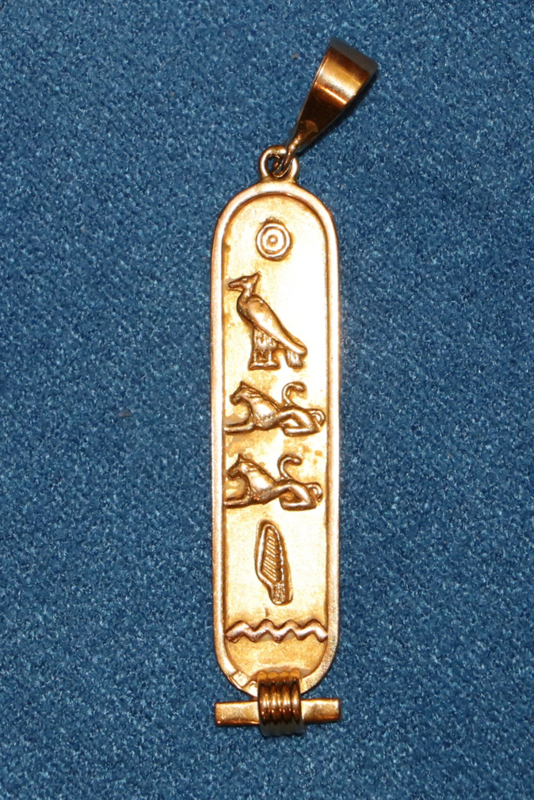 When I went to Egypt, I had a goldsmith fashion a cartouche for me with my name in Egyptian hieroglyphics. They not only remind me of old adventures overseas, they often are symbols of mentors of mine of the distant past. For example, there is more on my cartouche than just my name. The round circle, which is the first hieroglyphic, is a symbol for the Egyptian sun god, Aten. That circle is also referred to as the sun-disk. 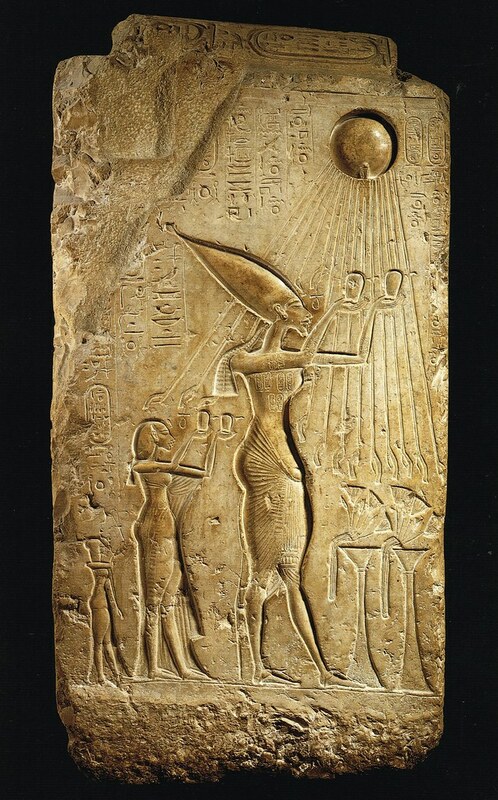 Scholars view the Aten or sun-disk as a very obscure manifestation of the Egyptian god, Ra. What is interesting is that Aten begins to appear during the Middle Kingdom in the 12th dynasty ca. 1991-1803 BCE, which was nearly four millennia ago. 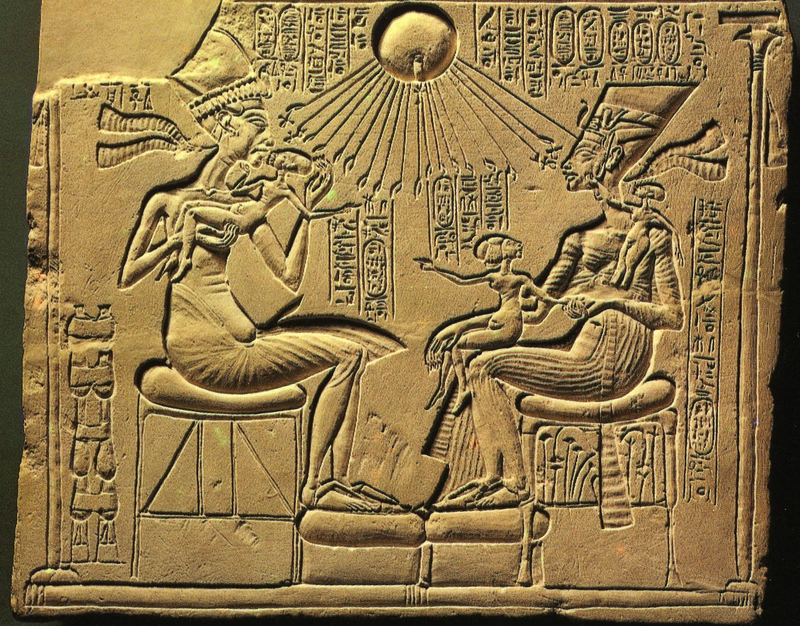 The following are two low relief scriptures of Akhenaten and Nefertiti worshipping Aten. Akhenaten ruled Egypt from ca. 1353-1335 BCE. 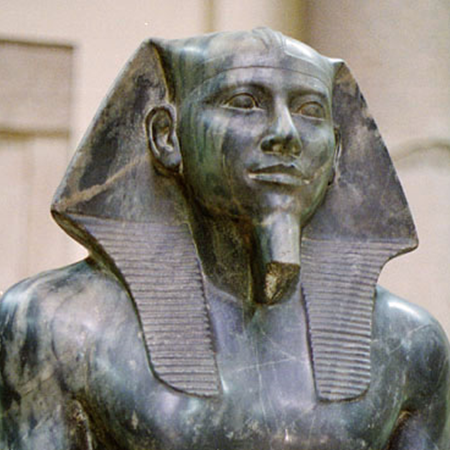 His given name was Amenhotep IV. However, around halfway through his short reign, he took the name Akhenaten, which means in Egyptian, Benevolent one of the Aten. Akhenaton is sitting on the left with his deformed body. This is Akhenaten standing on the right. During Akhenaten’s seventeen-year reign, he accomplished a great deal. They moved the capital to Amarna. He married Nefertiti and had at least six daughters and a son. 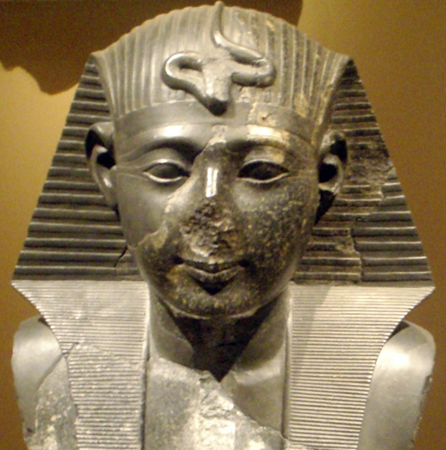 Aten became the dominant god in Egypt. In less than twenty years, the stylized portrayals of Egyptians changed radically to more human like forms. Finally, the religion moved from polytheism to monotheism. 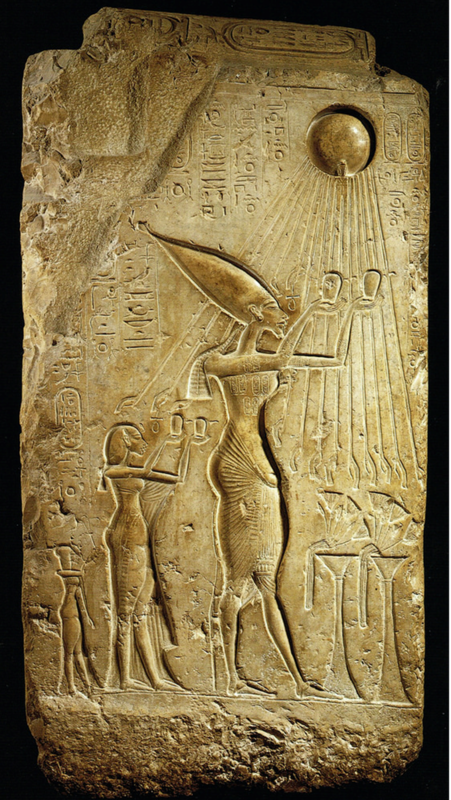 Akhenaten was a reformer. He wanted to make the Egyptian culture and society more up to date than it had been. In two millennia, the Egyptian mindset, art, and general Weltanschauung didn’t change much at all. Ancient Egyptian culture is divided between the Old Kingdom, which started around 3000 BCE, then the Middle Kingdom, and, finally, the New Kingdom ending around 1000 BCE. There is not much change from the Old to the New Kingdom in the portrayal of the pharaohs. With the exception of the reign of Akhenaten, the likeness of all the pharaohs was the same. Akhenaten worked hard at bringing change to the Egyptian society. Akhenaten was an ancient mentor of mine. It is unfortunate that he wasn’t a mentor to the Egyptians. Akhenaten was into reforming, but his son, Tutankhaten, and all the remaining pharaohs were into restoring the old ways.